We do our best to stay on top of health crazes, but when said health trends also happen to incorporate beauty benefits, well, we’re doubly attentive. That said, we take our “super foods” with a grain of salt, even when the evidence is overwhelming. Such is the case with sea buckthorn: Its botanical name refers to a Greek word meaning “the tree that makes the horses shine,” so you could say its reputation goes all the way back (more than a thousand years, even). We’ve tried both sea buckthorn oil dietary supplements and topical oils to great results, but don’t take our word for it. Here are the real reasons behind why you should try sea buckthorn oil! Fatty acids are the holy grail of nutritional beauty boosters, and sea buckthorn oil is rich not only in the three essential omegas (3, 6, and 9), but the rarer omega-7 as well. These fatty acids act as the “building blocks” for healthy skin, hair, and nails as they nourish and heal the body from the inside out. They also encourage good gastrointestinal health, which plays a key role in maintaining a clear complexion. It’s great for your digestive system. Just as it does on the skin, sea buckthorn oil has a soothing, healing effect on the digestive system when taken internally. It improves the quality of the stomach lining and reduces symptoms associated with acid reflux and other gastrointestinal issues and, by calming that inflammation, helps the body to restore its balance. It helps to prevent infection. In various cultures throughout history, sea buckthorn oil has been used primarily to fight bacteria and ward off infection caused by flesh wounds, but the oil fights inflammation in both its topical and ingested preparations. Applying the oil to inflamed, compromised skin can reduce the likelihood of infection, and taking it in supplement form can boost your body’s ability to ward off that inflammation in the first place. 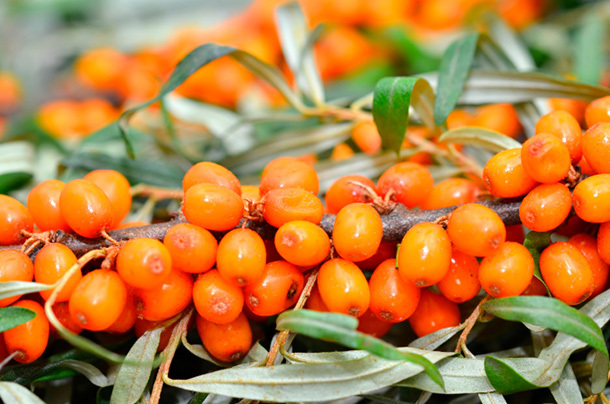 Antioxidants, fatty acids, vitamins A, C, E, and more—sea buckthorn is an anti-aging powerhouse. By neutralizing free radicals, rebuilding compromised skin cells, soothing inflammation, and plumping and protecting the skin itself, the nourishing oil helps to fight the key signs of aging, like wrinkles, sagging, and loss of elasticity, both with topical use and when taken as a supplement.